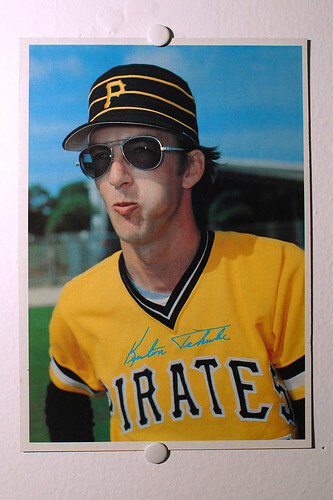 Last Friday I asked about unusual instances of athletes wearing sunglasses. The very next day — the very next day! — the sunglass gods dumped something into my lap: Yankees pitcher Kei Igawa took the mound wearing shades. According to this article (generously brought to my attention by reader Tessa Trego), Igawa isn’t used to pitching in daylight because he played almost exclusively in domed stadiums in Japan. The sun’s glare had caused problems for him during his previous spring training start, so he opted for the sunglasses this time around. Igawa isn’t the first pitcher to wear dark glasses, but he’s definitely the first I’ve seen wearing super-dark contemporary shades, which makes for an odd sight, sort of like there’s a blind man pitching. Interestingly, as Jeremy Brahm notes, Igawa’s countryman Daisuke Matsuzaka has been wearing those tinted contact lenses that cut down on UV glare, so maybe he’s having similar problems making the adjustment to daylight baseball. Incidentally, big thanks for the excellent sunglasses-related factoids that many of you have sent in over the past few days — you people rock and all that. I’ll be incorporating many of your contributions into my next ESPN column (which would normally run this Thursday, but it’s been bumped to next Monday or Tuesday because of all the NCAA tourney coverage), which will feature an in-depth look at the intersection of sunglasses and athletics. Uni Watch News Ticker: It’s nice that the Phillies held a memorial service for John Vukovich on Friday. 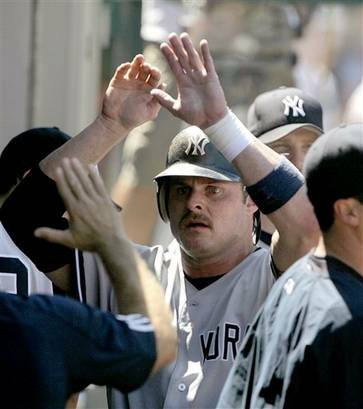 But it seems a little odd that they put a black armband on his jersey — it’s like he’s saluting himself. … Good catch by Bryan Redemske, who notes that Louisville’s Terrence Williams had “Money Time” written on his sneaker Friday night. … Fawning article here about N.C. State coach Sidney Lowe’s suits. … Barry Bonds wore a DC United jersey while warming up on Saturday. … Latest member of the do-rag club: Nook Logan. … Phony pit stain; real pit stain. … Two oddities from Saturday’s Klitschko/Austin heavyweight tilt: (1) The canvas was white, and (2) the ropes included ads for Klitschko’s web site, which made the proceedings seem kinda biased. … Good rundown of Minnesota high school hockey tournament jerseys here. … The Manitoba Moose had Military Tribute Night on Saturday. Note the camouflage tape on the shins — an impressive touch. Lots of additional pics at the bottom of this page. … Reprinted from Saturday’s comments: Good view here of the Hofstra lacrosse team’s memorial patch for Nick Colleluori. … Sure, this is fine, but I liked it better when he did this. … The Delaware State Lady Hornets have some pretty wild uniforms (with thanks to Matthew Wolfram). … Heartwarming sight yesterday, as Jose Cruz Jr. was wearing perfect — I mean perfect — stirrups. 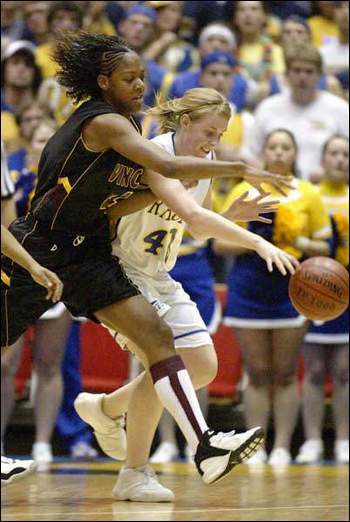 … And speaking of stirrups, Jeff Ash notes that Wisconsin girls hoops state champs Milwaukee Vincent has been wearing faux stirrup socks. Gators are going to tear up the tourny with their sweet gator print jerseys. Even if they trip over their baggy shorts. Why was the NCAA Tourney Committee Chairman on television wearking Nike gear? Speaking of shades here’s George Hincapie US cycling champion in his stars and stripes oakleys and logo creep champion jersey. Hey Paul, in your article you just say “into my lap: Yankees pitcher took the mound wearing shades.”, you might want to add Kei Igawa’s name in there… It would be less confusing… Sorry for nitpicking! Love the Entry though!! Quick correction – That’s the Delaware State Lady Hornets, not the University of Delaware Lady Blue Hens. Isn’t that Delaware State? Not Delaware. I’m unaware of any heated rivalry, or if their Alumni groups get all up in arms like some U of vs. State debates, but you may want to clarify. Relating to all the “System of Dress” jersey changes…why is it acceptable for basketball teams to change jerseys completely for the post-season? I’m sure if a football team completely changed jerseys before playing in a BCS game, the fans of that team would go crazy. Or is it that we’ve just become accustomed to basketball teams changing jerseys every other year? Just a random thought I had over the weekend. From time to time there are (probably fictional) stories about how some little old lady wins her office pool by picking according to team colors or whatnot. Is this not a job for uniwatch?! I don’t think an analysis of all 65 teams can be done in time, but simple binary choices are doable. That’s not nitpicking — it’s total brain-lock on my part. Thanks for the fix. Having been at that Moose game, the guys looked pretty good. They had spent some time at military installations during the week, getting a feel for how the soldiers live and what their days entail. As you said, Paul, the details were noticeable, like the tape on the socks. Someone had mentioned the patch on the left shoulder on the weekend? The Moose were wearing the Manitoba Moose Yearling Foundation patch, as they have all season. As a side note, it was also matched to the jersey in terms of the colour used (seen here on Brendan Brooks). They also wore a Canadian flag patch on the right shoulder, and a Canadian military patch on the left shoulder. The Moose Military uniforms are perhaps the best Cammo/military tribute unis to date. Maybe it’s the ‘outdoorness’ of the Moose, or the color (colour?) scheme. But it works for me. I liked that they changed the font to more of a military stencil, too. But I’ve got two questions. And what’s shoulder patch? All I can tell is that it’s got big hands, and appears to have text. Also this is the most unique way that I’ve seen someone enter a sporting arena. Wow, who’s this CRAZY GUY dubbed as a “design guru”?? Man Paul, you’re getting mad props from everyone nowadays huh?! ….but he is right you know. [quote comment=”59659″]Having been at that Moose game, the guys looked pretty good. They had spent some time at military installations during the week, getting a feel for how the soldiers live and what their days entail. Thanks for the Yearling answer. Also, there was a yellow ribbon patch on the left hand side of the jersey tail. well, college basketball teams play more than twice as many games than their football counterparts. And, as far as I know, nobody in basketball does the “mix and match” of jerseys and shorts that you see in football. most basketball teams have two or three unis. Oregon’s football team, for example, supposedly has enough combos to do a different look every day, all season. at least, this article says so. so, after 30-some games of wearing the same 2 uniforms, vs 12-13 games with 3-4 uniforms, I’d think that none of the football designs are stale enough to warrant replacement. The list is all the names of the Manitoba soliders who have fallen in the line of duty while in Afghanistan. Hey, JMC – I tried clicking on “all sizes” in flickr – it gave me what you see above – am I doing something wrong? 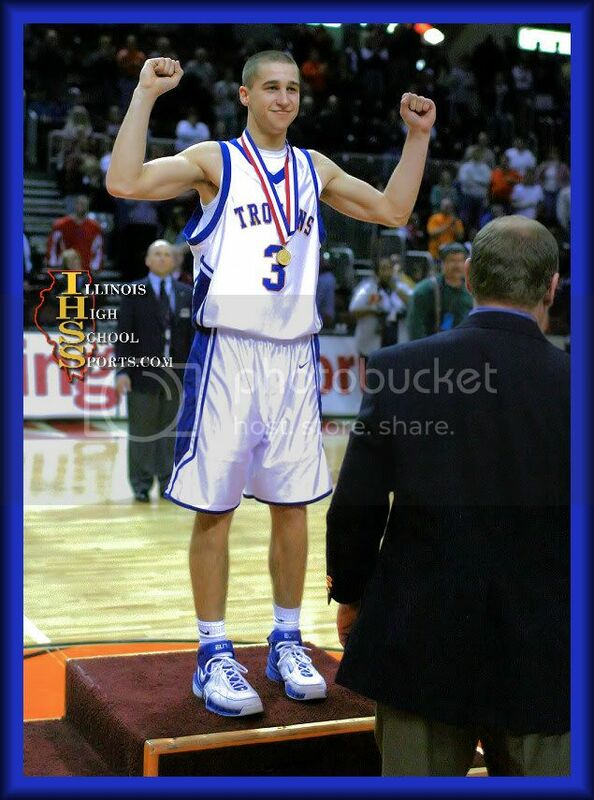 In this past weekend’s Illinois Class A boys’ high school basketball championship, beauty, a.k.a. Maroa-Forsyth, slew the beast, a.k.a. North Lawndale Prep. 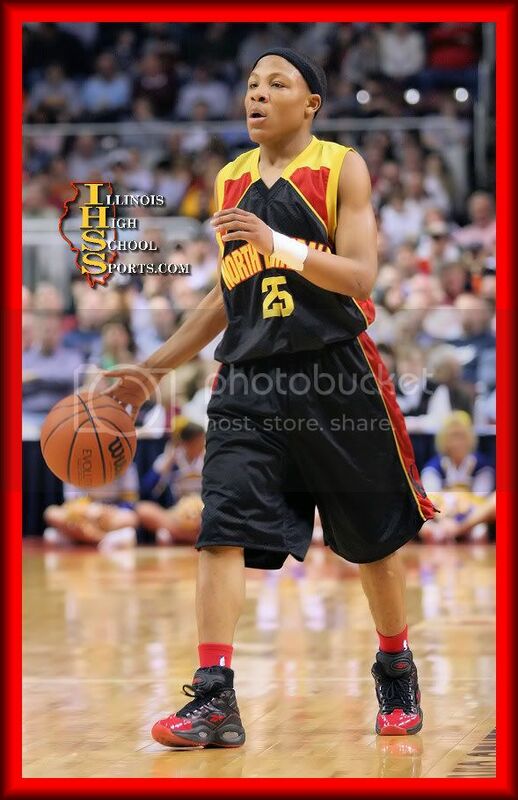 North Lawndale also had their names under the numbers on the back of the jerseys. Ugh. I think Jose Cruz Jr. must have gotten some pointers from his dad. Anyone check out the home and away jerseys from the MN High School website for Duluth Marshall. Man, those are sharp. I love how they used no white in the jerseys, just yellow and black. Did anyone else notice at the end of the George Washington-Rhode Island game Saturday night when Karl Hobbs (GW coach) emptied his bench with a couple seconds left, the walk-ons did not have names on their jerseys like the main players did. Is that a common thing in basketball? I’ve seen it in football before. And notice how Chris Carpenter’s anti-pit stain fabric is white… just like the rest of the jersey! I know that Ohio State has two walk-on players, Titus and Peters (former team managers I believe) that both played at the end of the Big Ten Championship against Wisconsin and also played at the end of some blow-out games throughout the season and they have their last names on their jerseys. Sorry… the Carpenter pic is #2 in the “home” slideshow… dunno why the link to that particular picture gave you the whole slideshow! The patch for Hoftsra is a nice touch. Nick was a player that played for a neighboring high school of mine and he was very courageous in how he handled everything thrown at him. Thanks for the info and a nice tribute by the Moose. On some of these new spring training jerseys, the heat-sealed jersey numbers really stand out. They look like low-quality replicas. Has a major league team ever worn non-sewn jersey numbers in a regular-season game? I know it was done routinely in the NBA, NHL, and NFL for a while in the 1980s and 1990s, but I’ve never seen it in baseball. Just wondering-why is a white canvas unusual in boxing? Is it because it would show (potential) blood? Late last night (or early this morning?) I was reading the tail-end of last night’s comments and there was talk of a hockey goalie getting cut above the knee and leaving the game. Well I googled “hockey goalie” to see where he could possibly have been cut and didn’t really get a clear answer, but I did find this young fella. I don’t know if anyone has noticed this before, but i just sat down to watch a recording of the red wings/bruins game from yesterday, and they had a clip of the teams leaving the locker rooms for the ice, and kris draper was wearing a red helmet while everyone else was wearing a white helmet. I assume it was for warmups since they didn’t look too serioius, but do they do this every game for warmups, or was this a mistake? It was Cam Ward – out indefinitely with a deep laceration to the leg above the knee. Don’t read while eating lunch. Trust me. After taking a week’s vacation, I come in to work and realize how much I missed you all. Thank you, Paul, and everyone else, for making my days better with Uni Watch. Oh, and while touring Petco Park, I saw a nice little exhibit on the history of baseball in San Diego, including some old time pictures. I took photos, and should have some up later tonight and I can link to them later on. Good looking uniform and sock combinations. That was a distake by the detriot guy, it was all over the sports news making fun of him. Those were an AHL teams new years unis, I don’t remember whoand youcant tell because they went all out and didnt put their logo on the front to ruin the tuxedo image. do we know what color facemasks the new Chargers helmet will have? Navy blue? Gray? I don’t know WHY it was exactly unusual, but it really was an overpowering amount of white. The ring ropes were also white. Peter King has a note about the Chargers updating their unis but NOT going to the powder blue. I’m pretty sure that’s been coveed here but is there a timetable for when they are going to roll those babies out? 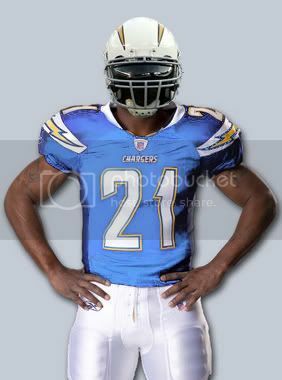 i read in yesterday’s boston globe that the chargers were changing uni’s and going to a white helmet – any truth? i’m an idiot. thanks paul! That’s a roller hockey team, not an AHL team. The ECHL’s Alaska Aces wore these for New Year’s. You can tell it’s a roller hockey team by looking at the skate “blade” of the goalie. That, and the lack of ice is another hint. That’s a real even surface with some sharp shadows for ice. I know it was roller hockey…the original page w/ caption said it…I was just putting up a picture :)…for what it’s worth, my friend’s boyfriend senior year wore a Tuxedo T-Shirt to Prom. She was NOT happy…at first, and then we just thought it was funny. Since it’s Spring Break…and I’m home bored with some friends…we’re off to pick our brackets. One based on uni’s, one on coolest mascot, one on most desirable Spring Break locale, and one for real. Should be a good time. as a mets fan, may i say what a physical specimen freddy garcia is. quick question…I’m blanking on this…Which team is home? Top line? We may be doing a home uni bracket, an away uni bracket, and a home vs away uni bracket. I see a personalized shoe line in someone’s future. The higher seed is ‘home’. [quote comment=”59676″]The patch for Hoftsra is a nice touch. i was a friend in high school at ridley high with Nick. It’s really heart warming to know that Hofstra will honor him. I was shocked when i saw his name on here (i read it religously), but it made me feel real good. Thanks Uniwatch! RIP NICK. Very Immature humor, I know, but check out the name of the author on the Cam Ward article. Sorry, I couldn’t resist. I don’t want to mess with registering (although last time I looked at the page the story just came up). Please enlighten me! LUKE DECOCK, it’s all in caps on the page so I don’t know if it’s DeCock or Decock. As stated in yesterday’s open thread, did anyone see the major stirrup striping on Texas A&M against Florida on the baseball diamond? That’s how baseball players should look IMHO! Wish I had pics, though. A bracket based on unis, eh? It’s a poor shame that Indiana and UCLA would face off in the second round and make that bracket a moot point right off the bat. I’m rather partial to Indiana’s red uniforms, though I also like UCLA’s whites…that’s a really tough call. I’ll let you and your friends figure that one out. I had the same thought. Hopefully Jose Sr is rubbing off on Jose Jr in more ways than the stirrups. I do miss watching games in the Astrodome. I was reading the story about Noche Latina on Sunday’s Open Thread. Toward the middle of the article about the Miami Heat it said –“A special NBA Noche Latina supplemental jocktag”. This may be a silly question, but, what’s a jocktag? Love the Reds new unis for 07 but can someone explain to me why they’re wearing striped pants with their spring training tops? The new unis have no stripes. Are they wearing last year’s pants? [quote comment=”59680″]On some of these new spring training jerseys, the heat-sealed jersey numbers really stand out. They look like low-quality replicas. I’m not convinced any of them use heat pressed numbers…is there any real proof? I know from experience when dealing with cool-base/under armour/moisture wickening type materials that they are very tough to heat seal. They ruin easily if you don’t do it right. I can’t imagine that any mlb team would do this today. I’ve seen heat seal/screen printed mlb number during spring training, but never during the season. One of the weirdest things I’ve seen is when the MD Terps football unis were done by nike, they used to have twill numbers, but heat sealed names on a nameplate. Strange. The jocktag is just the tagging found on the bottom of the jersey. It usually indicates the manufacturer, the team, the size and if there is any sort of special cut or anything for the jersey. The special Latina ones probably have a similar theme as what was on the uniforms. I dig the VU reference in the title. VU references always delight me. I knew it was ECHL, just blew it on the league. I actually didnt pay that much attention to the pic, just saw the tux and never looked to see it wasn’t the same goalie pic you always see of the ECHL pic. I just graduated from BU in May ’06. Are you a current student or recent graduate or none of the above?? Glad to see that on March 11 they even got a couple Florida players and the batboy on the right track in life! Why the reverse American flag on the right sleeve of the TAMU jerseys? TC, this is so that when the player rus forward, the flag appears to be flowing in the wing with the stars at the head. [quote comment=”59741″]TC, this is so that when the player rus forward, the flag appears to be flowing in the wing with the stars at the head. This is correct. Texas A&M is well-known for their Cadets. In the military, flag patches are always worn ‘backwards’ for the exact effect of the flag blowing in the wind when marching past. That is the proper display of the flag, actually. Very good for them! I don’t know of any other teams that do that? Maybe a good research project for another entry here? The military does this… the flag is supposed to be displayed as if it were really flying in the direction the person/machine is going. IIRC on March 2 vs Chicago, Detroit was wearing their “road” whites at home but Red Wing Jiri Hudler came out for warmups wearing the “home” red helmet. Both teams noticed and had a good laugh before they finally informed Jiri of the equipment faux pax. He went on to score a goal and have a pretty good game. I’m wondering if there’s some kind of trend or superstition or something and now a random Wing player will purposely don the wrong helmet for the warmups. If the Detroit papers haven’t picked up on this, it may be worth researching. no, i hadn’t seen those before, on here anyway. From the article that was linked to over the weekend those pics don’t match. I thought the article said white tops with navy pants away and navy tops with white pants home. those look like the ones that were posted over the weekend here. as legit as leaked unis get i guess. i don’t mind them but how do you update a throwback? i know it’s technically an alt but i think it would have been preferrable to keep it unchanged IMO. Those Chargers unis look like an artist’s or fans rendering, note the low color quality as well as lack of symmetry with the helmet bolts as well as not having any bumper logo/branding. So Paul, maybe 65 is too much to take on (even for your intern), but can we expect a Uni-alysis for March Madness? Maybe when it gets to the sweet 16? Or perhaps a top ten/worst ten for all the teams? They were just talking on the NESN broadcast of the Yanks/Sox game (love my MLB.TV subscription) about the new BP caps. They were trying to figure out what the purpose of the side panels is (aren’t we all) as well as commenting on how ugly they are. It was great. I actually attend Ridley High right now and i am glad people are getting to know Nick’s story. Plus its fun to see people who actually live around me that look at Uni-Watch. I’m not sure if Lowell Palmer wore these during games in the ’70’s, but if he did, they are as dark as any shades I’ve seen a pitcher wear. Any word on whether or not the helmets have jersey numbers on them? I find numbered helmets infinitely cool, as it is so easy to identify the wide receivers while they are running. They almost make shoulder numbers irrelevant! It says in one of the articles that there will not be numbers on the sides of the helmet, but there will be black numbers on the back of the helmet. I’m watching bracketology right now and Bob Knight was on wearing hsi St. Louis Cardinals black jacket and noticed that it has a nike logo at the bottom of the neckline. One shot had a player over his shoulder with the players adidas and Knight’s nike logo both clearly visible, interesting. Not uni related, but I was checking out MLB TV the other day and noticed the blackout restrictions. So this means that since I live in Wisconsin, if I sign up, I can’t watch Brewers home games? Someone shed some light on this for me, because that would defeat the entire point of me subscribing to the thing. It’s always been like that. I live in NY, so I can’t see Mets or Yankees games on it, because they’re always on regular tv. I have friends that put their friend’s addresses in other states, so even if they’re at work, they can watch the Mets and Yankees. The only problem arises when the Mets or Yankees play the team that is near the address that you gave when you signed up. Chargers helmets need the #’s on the sides! Give an address for Alaska. Don’t the Brewers have an FSN station–Green Bay i think it is? I know the Twins have FSN North, White Sox have FSN Chicago, and Cardinals have FSN Midwest, I would think the Brewers would have something. Or you can try the address in Alaska thing. Anyone see that Scott Kazmir has changed his number from 26 to 19? I don’t know about the legitimacy of the pictures, but in each of them the bolts on the helmet are off. Looking at the picture it’s the one on the right that’s farther toward the rear. The left one is lower on the front of the helmet. Set 2 was the “musical costume”, the album “Loaded” by The Velvet Underground. The vocal breakdown for that set is: “Who Loves the Sun” (Trey); “Sweet Jane” (Page); “Rock and Roll” (Page); “Cool It Down” (Trey/Page); “New Age” (Trey); “Head Held High” (Trey); “Lonesome Cowboy Bill” (Fish); “I Found A Reason” (Trey/Mike); “Train Round the Bend” (Mike/Fish); “Oh! Sweet Nuthin'” (Page). I live in NY, so I can’t see Mets or Yankees games on it, because they’re always on regular tv. I have friends that put their friend’s addresses in other states, so even if they’re at work, they can watch the Mets and Yankees. “Blackout restrictions apply to Services which allow you to watch video of live games depending on the date of the game, your location and local, national and international broadcast exclusivities. … For these Services, you must submit your email address provided by either your Internet Service Provider or place of work. For example, clicking on a live MLB.TV link will perform and trigger a number of checks to make sure that you are located outside of the applicable blackout territory. … IF YOU CIRCUMVENT, OR ATTEMPT TO CIRCUMVENT, ANY BLACKOUT RESTRICTION OR OTHER USE RESTRICTION: YOUR SUBSCRIPTION WILL BE SUBJECT TO IMMEDIATE TERMINATION AND A CHARGE OF ONE HUNDRED DOLLARS ($100.00) FOR EARLY TERMINATION; YOU MAY BE SUBJECT TO LEGAL ACTION; AND MLBAM RESERVES THE RIGHT TO REPORT SUCH MISCONDUCT TO APPROPRIATE LAW ENFORCEMENT AUTHORITIES. It appears that MLBTV checks your IP address every time you log in to watch a game, and will unleash legal havoc on you if you try to trick them. The entire nation of Japan, where I live, is considered to be a blackout area for all 30 teams. I have a US credit card with a billing address in New Jersey, but am terrified to sign up for MLBTV with it! I just graduated from BU in May Ã¢â‚¬Ëœ06. Are you a current student or recent graduate or none of the above? ?